These diner mugs feature a lovably stubborn pooch doing the exact opposite of the commands being barked. 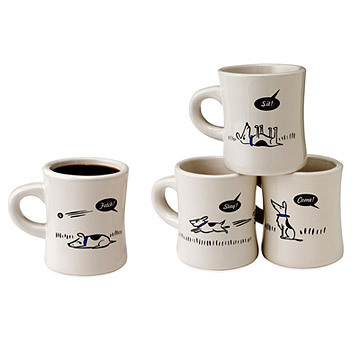 Capture the follies of training Fido with this set of Bad Dog diner mugs. Off-white mugs made in China, decorated in Minnesota. Complete your litter of Bad Dog ® with glasses and coasters! Top rack dishwasher and microwave safe. Who doesn't know a stubborn dog? I give the mug 3 stars because of picture placement. The picture only faces outward while using your right hand and faces inward using your left hand. It would be 5 stars if the picture was on both sides of the mug. Heavy mugs keep liquids warm. Cute design made my mother in law laugh. Since they were given as a gift I haven't actually used them, but I'm still getting positive comments from the recipient. How doesn't know a stubborn dog? I'd give 5 stars but I found one problem. The illustrations are hysterical for any dog lover/owner that knows commands don't always apply to the canine! My only con is that the illustration only faces you if you hold it in your left hand. Many mug handles are right-handed. This does bother me with this purchase. Cute, simple designs. Sturdy & heavy. My friend loved the design and said they perfect for her house. Have the glasses version of this and use them all the time. Continue to chuckle at the sayings because they apply to so many dogs with big personalities. It's a great laugh--or at least a smile--with every cup of coffee (or tea). They hold 10 oz which is our preferred size for coffee. They have a nice heft--almost "diner mug" weight.